Shauna Aura Knight is a LibraryThing Author, an author who lists their personal library on LibraryThing. See Shauna Aura Knight's author page. About meAn artist, author, ritualist, presenter, and spiritual seeker, Shauna travels nationally offering intensive education in the transformative arts of ritual, community leadership, and personal growth. Shauna’s work is inspired by the mythic stories of heroes, of swords and magic, and of the darkness we each must overcome. That the challenges we face shape us, and help each character—each person--to become heroes. 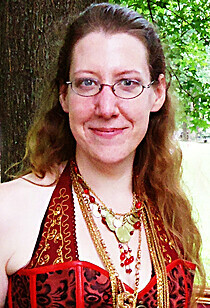 She is the author of The Leader Within, Ritual Facilitation, Dreamwork for the Initiate’s Path, and Spiritual Scents. She’s a columnist on ritual techniques for CIRCLE Magazine, and her writing also appears in the anthologies Stepping in to Ourselves: An Anthology of Writings on Priestessing, A Mantle of Stars, and Calling to our Ancestors. She’s also a fantasy artist, author, and poet, with urban fantasy and paranormal romance novels including Werewolves in the Kitchen, A Winter Knight’s Vigil, and The White Dress, the Autumn Leaves. Her mythic artwork and designs are used for magazine covers, book covers, and illustrations, as well as decorating many walls, shrines, and other spaces.